Home / Exam Technique / Should I stay in Higher level maths? Click HERE for a printable PDF of this post! Warning: long post ahead, but students and parents really need to read this! Should I stay in higher or drop to “pass” maths? Not an easy choice, but the key thing is to make an informed decision, not a snap decision! We’re going to guide you through the process. So, let’s look at the pros and cons associated with doing higher level maths, and the questions you need to ask yourself before continuing at higher (“honours”) level, or moving to ordinary (“pass”) maths. Note: if you are at Junior Cert level, some of this does not apply to you yet! But bear in mind, doing higher level maths at Junior Cert gives you the option of continuing at higher level for the Leaving Cert. 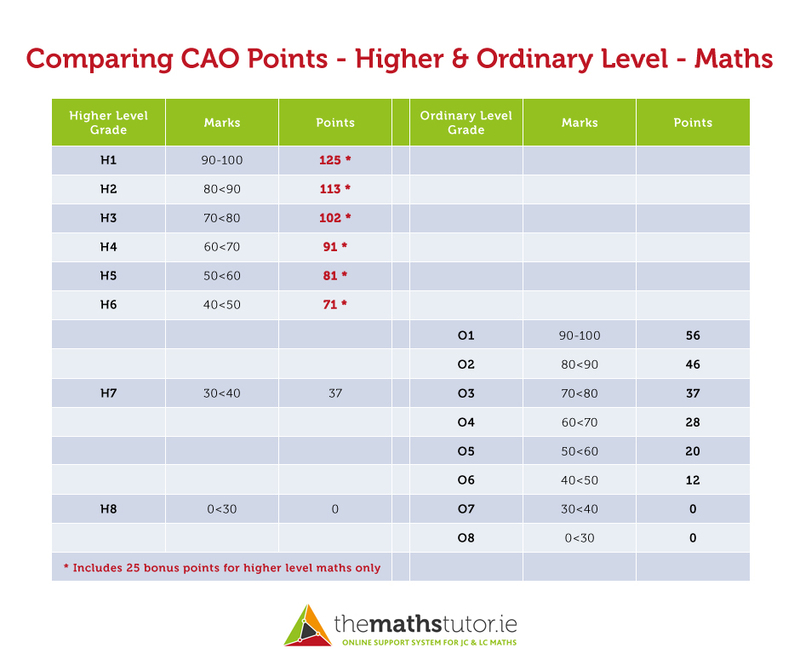 HL maths is the only subject where you can get more than 100 CAO points (for a H1, H2 or H3 grade). Do I like doing HL maths? Am I currently able to manage the workload for HL maths? Can I keep up with my class, my homework and my revision, and not let it impact negatively on some of my other subjects? Am I on track in my school tests / mock (“pre”) exams to get the grade I need? Am I willing to maintain or increase the effort I give to maths, to attain the grade I need? Do I need HL maths for my preferred 3rd level course(s)? If so, what grade do I need? Would OL maths suffice, and if so, what grade do I need? Am I personally more likely to get higher points in OL or HL? Check our infographic above to see how the different grades compare in OL and HL maths! 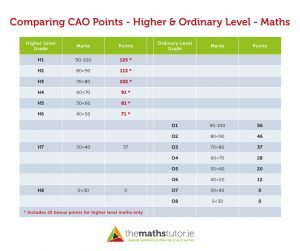 How many CAO points do I need, and how is that likely to be made up? Do I need to get more than 100 points in a subject i.e. HL maths? Am I likely to count maths as one of my 6 CAO subjects? Is HL maths impacting negatively on some of my other subjects? Is it helping me in some of my other subjects e.g. physics, applied maths? How close are we to the exams? Am I likely to drop to OL late in the school year, or even on the day of the exam? Is this a good strategy in terms of my overall workload, and in terms of my final grades? Am I getting the support and resources that I need to make HL maths more manageable and enjoyable? Have I discussed this with my maths teacher, my parents/guardian and my career guidance teacher? Yes, it’s a lot of questions, but they will help you to clarify your thinking in this area. When you have answered them, and consulted with your teachers and parents, you will be in a good position to make your decision. We love to see students do well at higher level maths, but we equally value and support our ordinary level students. This is very much a decision for students to make individually, after giving it careful thought. Review the pros and cons of staying in Higher Level maths, go through the list of questions to figure out how it applies to you personally, and discuss it with your teachers and parents, as they know you best. Then make a positive decision on whether to continue at higher level or to change to ordinary level. When the decision is made, commit fully to doing your best at that level. We’re here to help you, whatever you decide!